Scented geraniums are low-maintenance perennial plants that attract butterflies, birds and bees to your yard. Use them indoors as a fragrant, natural air freshener. Fragrance is released when a leaf is touched. The oil collected from the leaves is often used to create aromatherapy products. Citrus-scented geraniums are very responsive; the slightest touch releases fragrance into the air. Lemon-scented Pelargoniums, such as "Golden Lemon Crispum," are upright-growing shrubs featuring yellow-edged leaves. The leaves of "Prince Rupert Variegated" have white edges and white flowers that fade to a light pink. The scented geranium variety called "Finger Bowl" is compact, with small leaves, and can be used in creating topiary displays. "Bitter Lemon" has a strong lemon scent and bright lavender flowers with burgundy markings. "Prince of Orange" scented geranium has rough leaves with a crisp orange scent. "Lime" has delicate lavender flowers and deep green leaves. There are several varieties of rose-scented geranium plants. Some of the more popular ones include "Rober’s Lemon Rose," which can grow into a bush about 3 feet tall and 4 feet wide. The medium-pink flowers and large leaves give off a lemon-rose aroma when touched. 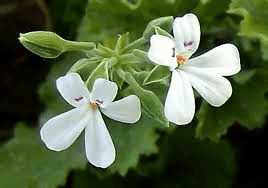 "Snowflake" is another large scented geranium that can spread over 4 feet wide. The leaves are a fuzzy green variegated with white. "Little Gem" is a compact rose-scented pelargonium with pink flowers and gray-green leaves. Peppermint-scented geraniums, "Tomentosums," are compact growers with small trailing leaves. They can be grown on a windowsill in a pot to be enjoyed indoors. "Joy Lucille" has red-marked pink flowers and "Godfrey’s Pride" features pink flowers and a pungent mint scent. Ginger-scented geraniums, such as "Torento," are upright-growing pelargoniums. The crinkled leaves grow on stiff stems. Nutmeg-scented geraniums spread low to the ground and have small white blossoms. "Old Spice" is a compact-growing plant with a spicy scent coming from the soft gray-green leaves. Apple geraniums are early bloomers. 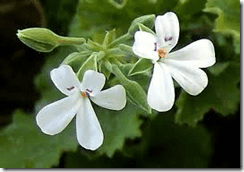 "Pelargonium Odoratissimum" is low-growing plant with small rounded leaves and white flowers. The "Apple Cider" variety has a spicy undertone to the apple aroma. It also has white flowers and leaves but tends to be slightly smaller.